Creatively designed, our PVC Packaging Bags packing and shopping bags are extremely user friendly and at the same time eye appealing. We offer bags in varied designs and styles, our product range features high end quality and durability. We manufacture the Heat Sealable pvc Bags which are used to protect the packed objects from dust and rain. These bags exist in various design, shapes, color and sized according to the current market trends & buyer requirement These bags are easy to carry as they are of light weight. These bags are available in various options according to the needs of our clients. 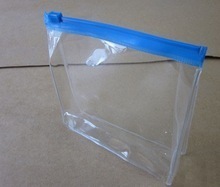 We manufacture the Heat Sealable PVC Zipper Bags which are used to protect the packed objects from dust and rain. These bags exist in various design, shapes, color and sized according to the current market trends & buyer requirement These bags are easy to carry as they are of light weight. These bags are available in various options according to the needs of our clients.